We have our cars serviced regularly, so why not our recompressIon chamber facIlItIes? After havIng spent several years assessIng various chambers all around the globe, DAN has developed the Nuts & Bolts chamber maIntenance traInIng course to help chamber staff wIth maIntenance. In the last issue of Alert Diver, we shared with you the launching of the new IDAN chamber maintenance training course. This is an initiative that focuses on empowering chamber technicians and general staff members, based at remotely located yet essential hyperbaric medical centres, to be able to take better care of their facilities through simple servicing and inspection activities. 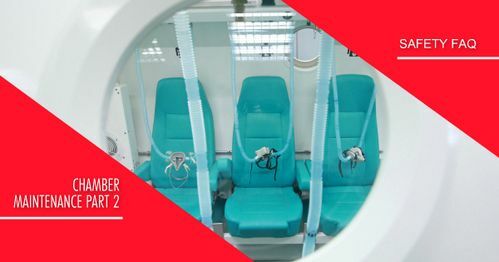 While something specialised like proper oxygen cleaning of piping systems and control equipment before these are exposed to high levels of oxygen is perhaps understandable, who feels really confident entering a chamber where the fire-extinguishing system is not tested regularly to be sure it will work if it is ever needed? So, what we need is a well-constructed maintenance plan; one that does not imply an unaffordable budget, and the basic skills to go with this. There are a few important facts to consider as to why we should pay attention to this essential safety issue. I mean, we all have our cars serviced regularly, don’t we? This is partially because motor vehicles represent a substantial investment to us. However, more importantly, we do not want to either put ourselves or our families at risk from accidents due to a breakdown or failure, or find ourselves stranded just when we really need to be somewhere else! This holds the same for a recompression chamber facility. Any breakdowns or failures can result in a compromise in the medical care we are trying to provide, or render the facility unavailable to someone in need, or even cause injury or death to our patients or staff members. Repairs usually have a habit of being required at very inconvenient times, and we all know that a rushed repair is a very expensive repair. And for those who have invested heavily to provide the facility, denying treatment to an injured diver means loss of revenue. Many of these remote facilities survive on only a few treatments a year, and being shut or unavailable due to poor maintenance is inexcusable! The greatest reason for all of this lies not in the unwillingness of staff manning these centres. While financial considerations do play a role, we have found that there are really two primary reasons. Firstly, finding appropriate training on the rather unique assembly of equipment and machinery making up a treatment facility has been, up until now, almost impossible. And secondly, figuring out exactly how to string along a series of checks, tests, inspections and basic servicing techniques to cover a complete facility appears to be a rather daunting task, even to those who have had some training. The Nuts & Bolts Chamber Maintenance Training course, offered to support our RCAPP participants, provides the facility with all the information that they need to establish a comprehensive, planned and effective maintenance programme, together with hands-on skills training to ensure that the staff know how to implement all the activities. This is offered on-site, so that the skills relate to the actual equipment that the facility has, rather than a generic series of equipment, instruments and controls. So, we are able to provide two of the key elements of competence: training and a degree of hands-on experience. Then it is up to the chamber owner, medical director or facility manager to ensure that the skills are put into place before declaring the staff member competent. Best of all, DAN remains available to provide on-going advice, input and updates! We want to remain as a part of the team so that the hype of the course is not lost in the “mists of time”.